Discussion in 'iPhone' started by lilcosco08, Jul 29, 2011. The mute button on the mockup is on the left. On the case, it's on the right. I'd hardly say that's perfect. Good try though lol. I actually like that mockup. The back is similar obviously to the iPad. Jeez, I think the overall design is what the op is on about, rather than where the freaking mute button is located. Someone give th OP a break. Nice mockup. And I am sure many will love the new iPhone once it is released. I personally told myself not to upgrade for a year or two. Not sure if this will be possible. If Apple strats throwing new features at me of which I had no idea that they change my life I might break and upgrade. True true and wasn't trying to be harsh, bro. I love the iPad like design. I was wondering if these cases are really for a chinese knock-off of the iPhone and not the Apple iPhone? The design is also said to be slightly larger than the existing iPhone 4 and has a slight tapering from top to bottom in thickness. Why does everyone think the home button will look like that? It's hideous and i doubt Apple would do such a thing. I like the first mockup, not big at all on the tapered design of the second. I don't really want a phone that's going to flip out of my hand. I hope they go with matte aluminum on the back though for sure. I like my iphone 4, but the glass is ridiculous. I only keep my phone in a case because of that. There are other sources that say it looks pretty much like the iPhone 4. There are so many different rumors about what it looks like that they're all pretty much useless. Just how Apple likes it. There is absolutely no reason on earth for that horrid taper. I wish people would just stop it. Tapering the next iPhone chassis would be terrible. It would be so uncomfortable to hold. People would be more likely to drop it and such like that. I don't even like the tapered design on laptops, but that argument is for another time and place. Maybe apple could bring most iDevices to aluminum? 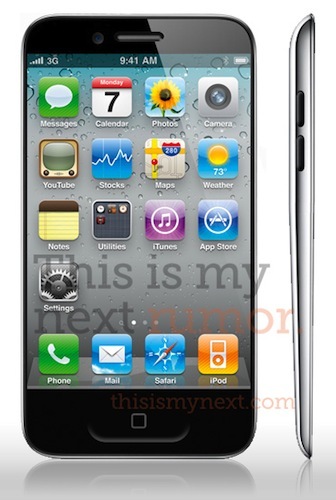 But i agree, i think we can expect a similar designed iPhone, probably resembling a curved iPhone 4. Regarding the home button.. i highly doubt Apple will change the famous Home Button all of a sudden, i know they're in the works of getting rid of it soon. But i do think that the space next to the home button might be LED notifications, just a thought.